Insect sting allergy or hymenoptera venom allergy exists in patients who experience large local (LL) or systemic allergic reactions (anaphylaxis). An enlarged local reaction is defined as a reaction larger than 10 cm in diameter which lasts over 24 hours, in which signs and symptoms are confined to the area of the sting site. A systemic reaction causes generalized signs and symptoms ranging from mild to life threatening. Mild, systemic reactions, can be limited to the skin and include flushing, hives, and swelling. More severe systemic reactions can involve wheezing, swelling of the larynx or throat, and loss of blood pressure. The most severe reactions can result in death. Worldwide the mortality is probably underestimated. In up to 50% of individuals who have had a fatal reaction to insect stings have had no previous history of a systemic reaction. Insect sting allergy or hymenoptera venom allergy can be effectively treated with venom immunotherapy (allergy shots). The sensitivity is caused by a specific antibody (IgE) and, if someone is sensitive, it is responsible for a significant morbidity and impact on the person's quality of life. The emotional issues of insect stings sensitivity is a major problem for the allergic individual and their family, friends, and employers. The reaction an individual suffers, is secondary to sensitization to one or more of the major venom allergens. Some of these allergens are sometimes shared. 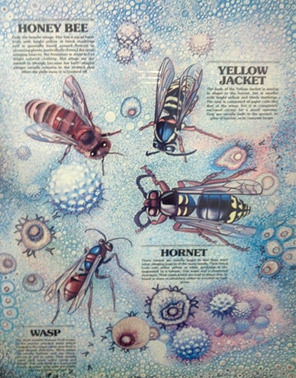 For instance, honey bee venom and vespid venom, yellow hornet, white-faced hornet and yellow jacket, share a 50% likelihood of cross reactivity. Risk factors for sensitization include such things as your occupation, sports activities, climate and geographic location. A higher degree of sensitivity exist among bee keepers and greenhouse workers because of exposure to stings. There is no evidence of a higher risk of allergic systemic reactions in patients who have other allergies. Most fatalities occur in elderly people who have concomitant respiratory or cardiac disease. There is a subset of individuals who also have a higher risk, and those individuals have a condition called systemic mastocytosis. Up to 26% of the population develop large local reactions to insect stings, whereas, 7.5% have allergic systemic reactions. Depending upon a country's climate, anywhere from 56.6% to 94.5% of the population has been stung at least once in their lifetime. The incidence of large, local reactions range is from 2.4% to 26.4% in the general population, and 38% in beekeepers. The prevalence of allergic systemic reaction is between 0.5-3.3% in the United States. The allergic systemic reactions are lowest in children ranging from 0.15-0.8% of the population. At least 40-116 fatal sting reactions occur each year in the United States, but this is felt to be under reported both here and in other countries. Avoidance of hymenoptera stings is difficult, and insect repellents are not effective. Anyone who has had an insect sting reaction should carry an emergency treatment kit and be prepared to self administer the epinephrine in case they are stung. Anyone who has a hymenoptera venom allergy should be seen by an allergist or a physician familiar with treatment. Venom immunotherapy (allergy shots) is considered a safe, effective treatment, to reduce the risk of allergic systemic reactions on subsequent stings, and improve the patient's quality of life. It is indicated for any patient with allergic systemic reaction who has had positive skin tests or serum specific IgE to the venoms. Guidelines now say we can treat large local reaction with venom immunotherapy. When one is undergoing venom Immunotherapy, it is still recommended they carry an emergency treatment kit after achieving what is known as maintenance dosage. In the United States, patients who have had a cutaneous reaction consisting of hives, generalized itching and redness, and are 15 years or younger, are not candidates for venom immunotherapy (allergy shots), because of low risk of allergic systemic reactions on being re-stung. Actually, in Europe venom immunotherapy is withheld from all individuals with such reactions regardless of age unless they are beekeepers or at high risk of being stung. However, in the United States, adults with similar cutaneous allergic reactions are prescribed venom immunotherapy. The ideal length of time of immunotherapy is still controversial, although a 5 year course provides long-term protective therapy. Some centers will treat subjects for three (3) years and then stop. Sometimes it is recommended to continue the venom immunotherapy (allergy shots) indefinitely depending on the severity and complexity of former reactions. References: World Allergy Organization (WAO) White Book on Allergy: Editors : Pawanker, Canonica, Holgate and Lockey. Copyright 2011. In the case of insect sting sensitivity, as with any disease, prevention is preferable to treatment. We would like to pass on to you a number of things we have learned over the years in our practice which have served our patients well in terms of preventing them from having stings, or if they are stung, what measures they should undertake. It is very wise if you are going to be digging in the ground or moving logs, flagstone, fence posts (etc. ), to observe the area carefully before hand. Of the five main stinging insects we consider most concerning, yellow jackets are the only ones that live in the ground. If you disturb their nest while digging or moving something, you will be stung. Taking a few minutes to observe the area carefully for insects that are flying to and from the nest can be a very valuable preventive measure. From our perspective, the yellow jackets have flight patterns and usually approach the nest in those patterns. Standing back for a few minutes and observing the area, we believe, can be very helpful in seeing those flight patterns in identifying the location of the nest. Wasp nests are usually above the ground by several feet. Working around shutters, spouting, mailboxes and changing light bulbs in lampposts, are risky activities. They also seem to love the cap of a propane tank. Wasps generally do not sting us unless we have direct contact with them. If, for instance, you are within one foot of their nest it is almost guaranteed you will be stung because they will protect themselves and their kind. A flying wasp (or other foraging stinging insect) looking for food quietly is not going to likely sting you while you are quietly sitting on your back deck. We have never had a patient tell us they have been stung by an insect flying around them (all bets are off if you are swatting). When you are stung by a wasp, you will likely not see the wasp until after the sting. Hornet's nests are round and become larger as the summer progresses. They are typically hanging nests we have all seen in the fall and wonder where they came from, having observed the area throughout the summer season without recognizing the presence of the nest. The camouflage of the nest is quite striking and one wonders whether or not the Confederate army chose gray because gray is such a good camouflage color in the temperate zone country. Generally speaking, most patients are stung by backing into bushes where hornet nests are, or in the case of children, while throwing rocks at the nest, or otherwise disturbing it. Bee stings usually occur from people walking around in the grass in sandals or without their shoes. The simple act of being sure your feet are fully covered with shoes when you are in the grass, is a definite preventive step you can take for your children and yourself. If you would like to schedule to see one of our physicians concerning your insect sting allergy or problem, please call our New Patient Line, 717-393-9439.